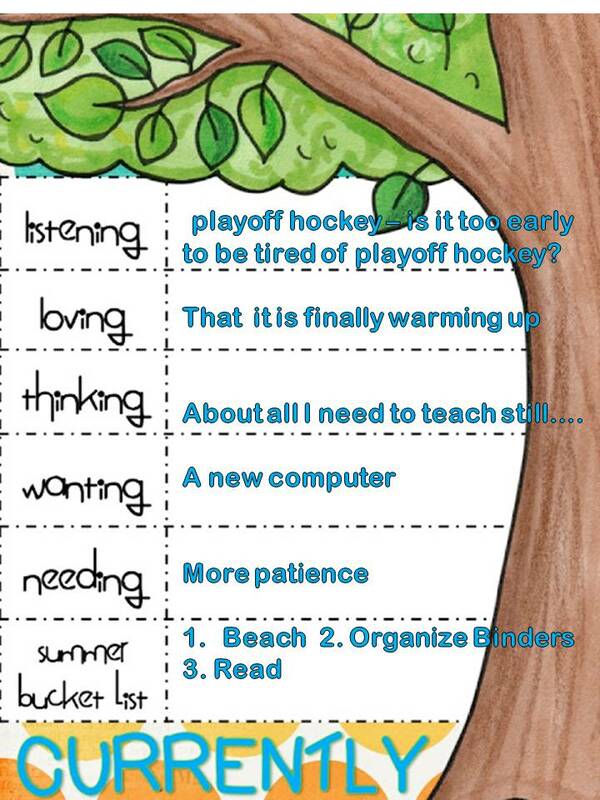 I am linking up with Farley at Oh' Boy 4th Grade for her May Currently Linky. I am needing some more patience - both at home and at school - it is just that time of year when there are too many demands on your time! I am hoping to organize my school files into binders this summer (maybe at the beach) wish me luck! 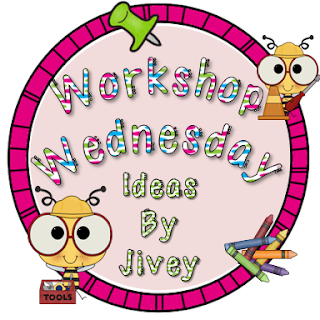 I am also linking up with another fantastic blogger, Jivey for her Workshop Wednesday linky. This week's theme is books you like to use in small groups. I chose a book and then I read a bunch of the other posts and now I feel bad that I did not choose a novel!! 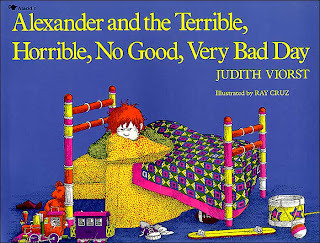 The book I chose is Alexander and the Terrible, Horrible No Good, Very Bad Day by Judith Viorst. Look at all those commas - great mini-lesson right in the title! I use this book at the beginning of the year when we are working on story retelling skills and writing retells. I also use it for making connections. This is the book I read with my lowest reading group. I love this book because the events are linear and you don't need to include every detail to get the point across when retelling - that being said it does lend itself really well for using transition words (first, next, then, after that, finally). I love this book because often times my low group has a hard time making connections and everyone can make connection to a horrible, no good, very bad day. Lastly it is a great book for modelling writing a retell about 1 day. 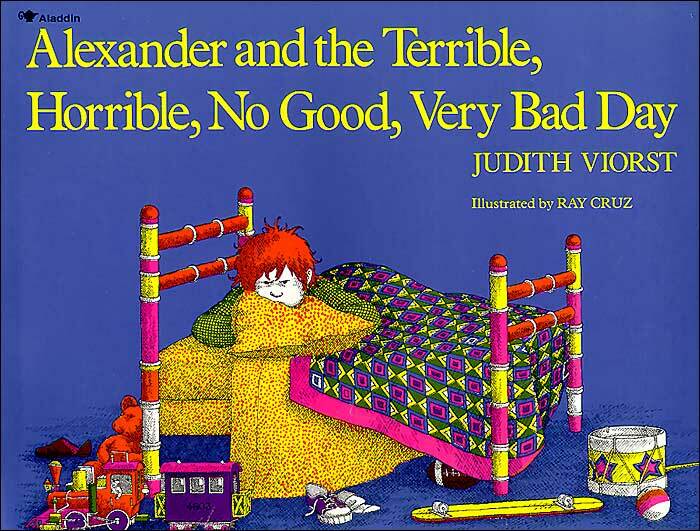 Even though only one group uses this book as a guided reading book I read it to the entire class, we watch the video and then everyone writes a funny retell of a terrible, horrible, no good, very bad day. The group that was already using this book love that everyone is working on their book. This video is a great way to introduce adding sound effects and music to enhance the reading of a picture book - which hold up - that's right is an expectation in Ontario. I watch this video and then have the students do the same (well their version of adding sound effects) to the other Alexander books. Just in case you are looking for a way to cover a media literacy expectation at the end of the year (and you teach in Ontario)! This was one of my favorite books as a kid. I also love when you can find videos that go with the books you are reading. It is another great way for the kids to see literature! I haven't read this book in so long! I really think a few of my kiddos would appreciate it. Thanks for the reminder! I love this book. Whenever I have a bad idea, I say, "Maybe I should move to Australia." :-P Thanks for linking up!! Great pick! I love this book. I have also used the book for cause and effect in my guided reading groups. Loved it as a kid, and still love it as a teacher! Media literacy expectation of adding sound and video to picture books? Hmmm...that is intriguing right there! I haven't seen this book in so long and I love how you described the ways you use it with your class. Thanks! I love that book so much! I even have my own Alexander -my second son. I gave up on having files. I just use Google Docs now. Virtual filing cabinet. I figure if it ever fails I will just go back to Pinterest! LOL! I need to organize my BOOKS this summer. Ugh. Love your blog! I've got tons of organizing to do this summer, too!! I "inherited" a full classroom when I moved down from 5th grade to kindergarten this year. I wasn't sure what I would need, so I kept almost everything. Now I can't wait to PURGE, PURGE, PURGE!! :) Good luck to you! Love that book!! Such a good one! Love that book! When I drop my boys off, I always tell them to have a terrible, no good bad day, so we can move to Australia! I loved reading your Currently! So fun! If you have time, I would love to have you drop by my blog, enter my latest giveaway, and join my latest linky. I am asking bloggers to share their favorite nonfiction author(s)/book(s). I am also your newest follower--at least I am if it works! Have loved that book since I was in elementary school! Thanks for sharing the video, I will have to show it the next time I read the book!